This premium White Flexible Extended Set Adhesive is a popular option for both home tile installations and commercial projects. It can be used on walls and floors and provides high strength adhesion. This easy to use adhesive does not require admix as you simply add water. This versatile adhesive is suitable for use with a variety of materials including Natural Stone, Porcelain, Ceramic and Wood Flooring. It is not suitable for Quartz Tiles. 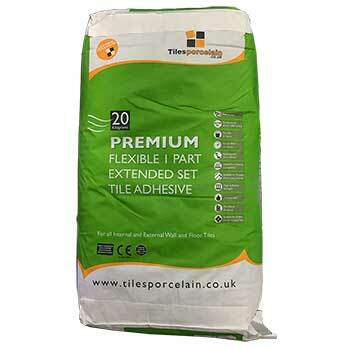 This adhesive is suitable for underfloor heating systems and can be used in both internal and external areas. For best results please follow the instructions on the bag of adhesive. The preparation of the surface is vital in providing a successful adhesion so you should therefore ensure the substrate is clear from any dirt, dust or debris.